“My own wonderful little secret!” I think to myself. I sigh and gaze around me, at the Maltese countryside, its vibrant colours, the mild weather. I bless my good fortune that I was born here, a winter Plein Air paradise! It is March, the sky is a serene cerulean blue and the Maltese sun is already warming up. I can feel it as it caresses my back and relaxes me while I am happily painting away and absorbing the surrounding scenery. As I sit here quietly painting and contemplating the view, I find myself listening to the buzzing of the insects as they flit from one plant to another. I can also just make out some bird song coming from the bushes nearby, a shy but very talented warbler perhaps? While a few hundred metres below me I am captivated by what can only be described as a secret paradise, a jewelled sea, sparkling in aquamarine, cobalt, Indian yellow, cadmium orange and turquoise blue, as it gently laps against the rocks and runs between the boulders which line the coastline this end of the island. This softly undulating Gozitan and Maltese countryside is so geologically and visually unique with both islands bearing characteristically low terraced hills carpeted in yellow daisies throughout winter and purple clover in spring. In between these little hills, you might also discover one of the many protected secret valleys filled with an abundance of unexpected flora and fauna that would surprise any keen botanist. A visual feast for any artist who loves to paint Plein Air, these secret places are always so exciting to discover, you just have to capture the moment on canvas. To the visitor, the Maltese winter is more like a prolonged spring – one which lasts from end October to May. Each season has its particular colour palette, and just like a musician in an orchestra, each flower comes out as if on cue to announce each changing month. While I sit out here in the open air painting away and trying to capture this unique and wonderful wild garden of colour, I also realise that probably the rest of Europe is still covered in a blanket of snow or fighting the cold and that is why above all else I think that the Maltese Islands are the ideal Secret Painting Holiday destination. Imagine you could be here in March and painting out in the sun by the sea. A secret paradise, what more could an artist want? Just picture yourself painting with, or as for me tutoring a group, of artists in serene surroundings in the middle of winter. 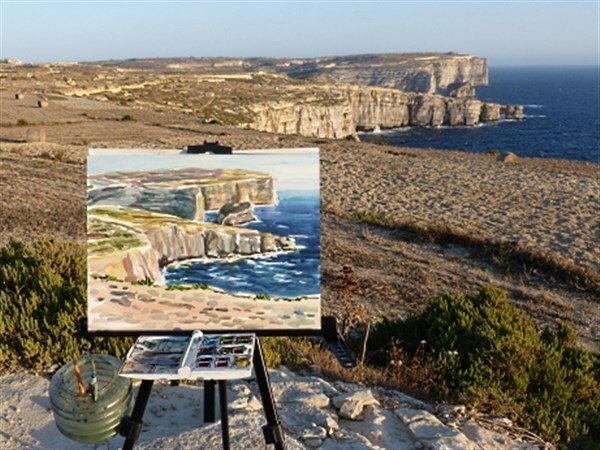 In October this year, Chevron is organising a seven day painting holiday for you to discover the Maltese countryside at its best and once again during the winter months of 2016 we shall also be offering you this once in a lifetime holiday. 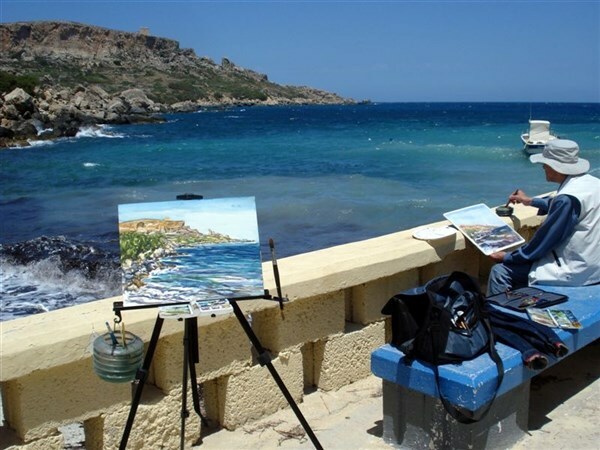 Groups are limited and the course is in drawing and watercolours and aimed at beginners and intermediate artists – An all-inclusive holiday, everything is taken care of, all you have to do is book and pack and we will take care of the rest – so do not miss it – contact Max at Chevron to give you all the details and book now. Malta is truly a wonderful sight to see. It may be a small island but it surely has a lot to offer its visitors. Thanks for sharing this post. Your painting looks great.